A GPS network is a high precision Global Navigation Satellite System (GNSS) providing real time corrections and data for post processing. A GNSS network consists of permanently located GPS receivers, installed across the state, that generate real time high accuracy GPS positioning. Basically, all of the permanetly installed GPS receivers send their data to a system that analyizes the input and adjusts and corrects the data to provide the most accurate locations. The Nevada GPS Network (formerly Washoe County GPS Network) is now being managed by the State of Utah. The Nevada GPS Network provides users with real time corrections and data for post processing. 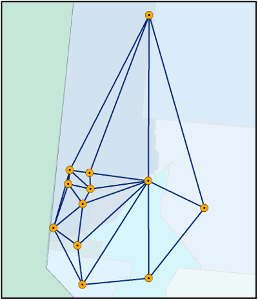 The Coordinate Reference Frame for this network is NAD83/94 (HARN). The Latitude, Longitude and Ellipsoidal Height of each reference station was calculated by processing 24 hour files using the National Geodetic Survey (NGS) Online Positioning User Service (OPUS) Projects application. With an activated subscription, set your GPS unit's VRS connection address to 168.179.231.11 and port 2102. Enter your new device-specific username and password. For Trimble units we have three different connections. VRS_CMRp works with Trimble units that are newer but may not have the latest updates to the firmware. All of these give you the network solution. For non-Trimble units we have two different connections. Both of these give you the network solution. MS_CMR, MS_CMRP, MS_RTCM3.2 these are for connecting to single base when you are on the edge of the network or not getting a strong network solution. System will automatically find the closest station and connect you. The Nevada GPS network is providing 24 hour Rinex files with 5 second epoch available for download here: Nevada GPS Rinex Download Due to storage limits, files can only be stored for a 90 day period, than they are permanently deleted. To pay for your subscription, visit turngps.utah.gov to access the online payment system. The cost is $600 and gives you access to TURN GPS Network also. You’ll need a credit card to process your payment. Select “Register” on the navigation pane on the left-hand side of the page. Review the Terms and Conditions, and then click “I agree” to continue. Fill out all the required fields, including the name of your organization, your login/username, a password for your TURN GPS account, and your personal contact information. Click “Register” to create your account. At this point, the system will direct you to the payment page. Make sure that you have your payment information readily available, as the system will automatically time out after a while, requiring you to start over with a whole new login/username, password, and email. If the system keeps coming back with the password field empty, the system may think that your email is already in use and, therefore, will not allow you to move forward. Each subscription needs a unique email address (even if it is a made-up one [e.g., gpslogin@bobsbigburger.com]). After you have created/renewed and paid for your subscription, you will receive an email with a receipt. It typically takes the system about 24 hours to process a payment and activate an account for fieldwork using the TURN GPS Network. Accordingly, to avoid a disruption or delay in service please email Support Desk from DTS at agrc@utah.gov or 1-800-678-9440, or Mike Heagin from AGRC at mheagin@utah.gov or 801-538-3440, or Sean Fernandez from AGRC at sfernandez@utah.gov with your organization, login/username, and password. We will manually renew or create your subscription in the Nevada GPS network and push your subscription through the system as soon as possible. Once your account is successfully activated, you will receive another email confirming your subscription. If you have questions or require help contact the Support Desk from DTS at agrc@utah.gov or 1-800-678-9440, or Mike Heagin from AGRC at mheagin@utah.gov or 801-538-3440, or Sean Fernandez from AGRC at sfernandez@utah.gov.